If in Bali many buildings design in such a manner so implying form of gate, in Yogyakarta there are hotel cusorily in the distance its(the design is rather alike with buildings Candi Prambanan. That is him(her Quality Hotel, in Jl. Laksda Adisutjipto having nuance Java with modern combination with its form trapeze. According To its(the Public Relation Manager Assistant Tri Sutami, the assumption of course doesn't wrong, because inspiration initially of course refers to building physical of Candi Prambanan. Hotel with the eight floors, initially so called Hotel Belmon, then changes to become Hotel Aquila Prambanan, and last joined forces with network Choise, and change name becomes Quality Hotel. Before really enters the four star hotel, its(the guests will be greeted by two statues Hanoman. With all its(the sociabilities, employee who wraped by traditional cloth would sprier that opens door is greeting arrival of its(the guests. Foot pedal in lobby, most certainly guest will find comfort by settlement of its(the interior. There is two large size ceramics tuns, intentionally is put down in left and right entrance. While some jars made in Kasongan, Bantul, put down at elbow painting Affandi. There also there is fishpond with water douche taken care of two fragon statues is having crown. In front of his(its is arranged [by] gamelan bonang and gender and siter which at the time of certain filled the air. Hotel having 164 room;chambers is is business hotel and vacation. Hence not odd if at holiday season, room;chamber always full. The guests love to lodge here because close to airport, whereas access to downtown also relative easy. Around 85% guests we are domestic, only around 15% foreign guest, when met [by] Handicraft Indonesia. Told him, hotel which has operated the 15 years offers various its(the facilities and keunikan at each its(the room;chamber. There are some classification of room;chamber, for example Deluxe, Studio Suite, Honeymooner, Junior Suite, Business Suite and President Suite differentiated according to its(the facility type and equipment. One of its(the example, room;chamber Honeymooner with tariff Rp. 650000,-/day, has cubicle facility and guest complete with various [crafting/ diligence]s as interior. Even repro Post Of Fice photograph Yogya made by the year 1910 terpajang in wall. This room;chamber hardly enthused by recently married couple!express Tami. For guest wishs menu Chinese food can in Serayu Chinese and also Jogja Tei. Not only its(the menu, this restaurant also is design in such a manner with interior is having nuance China. For example just with painting and ceramics statue Kong Hu Cu which dipajang in glass cupboard. Athletic facility like fitnes and swimming pool also is provided in other location. While for meeting or seminar also available room is having capacities 50. 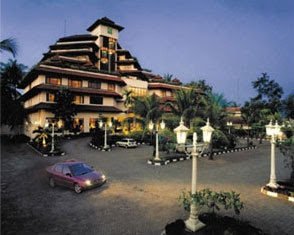 Though hotel as of class many dispersions in Yogyakarta, but Quality Hotel remain to can compete. Its proof, in general this hotel still becoming guests choice from various towns like Jakarta, Bandung, Surabaya or Bali.